Nintendo looks to still be building upon what they started last year with their cardboard playset experience known as Labo. They have unveiled what will be their fourth Toy-Con set, a VR Kit. This comes as a bit of a surprise as Nintendo has always remained skeptical when it comes to anything involving virtual reality. The VR Kit will come in two sets (as seen in the image gallery below). The first is the “Starter Set + Blaster” set that comes with a pair of Toy-Con VR Goggles and a Toy-Con Blaster. If players want to build upon this starter set, they can purchase additional expansion sets. Expansion Set 1 will feature Toy-Con Elephant and Toy-Con Camera, while Expansion Set 2 will include Toy-Con Bird and Toy-Con Wind Pedal. 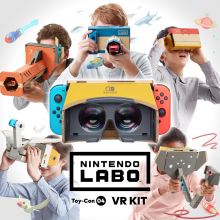 The second set is the full Toy-Con 04: VR Kit which of course includes all six Labo VR projects. Nintendo Labo Toy-Con 04: VR Kit will be available for purchase on April 12th, with the “Starter Set + Blaster” kit costing $39.99 USD, and the complete Kit priced at $79.99 USD. The individual Expansion Sets are going to be sold exclusively on Nintendo’s website, with each set being priced at $19.99 USD. What do you think of this news? Are you at all surprised by what the fourth Nintendo Labo Toy-Con Kit is offering? Does this intrigue you enough for you to try Labo out? Let us know in the comments below!